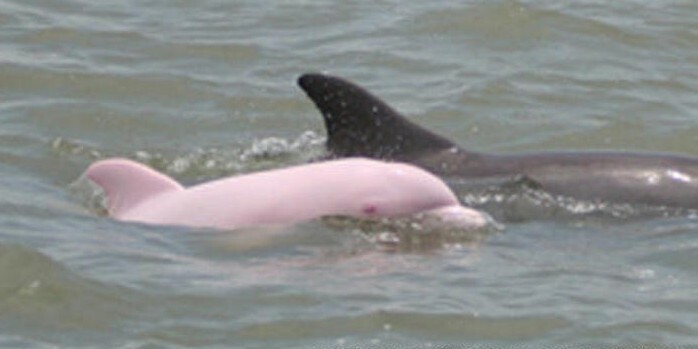 Rare pink dolphin sighted in Louisiana-Truth! - Truth or Fiction? 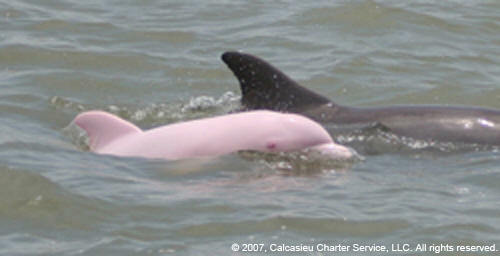 A forwarded email with pictures of what the message says is a rare pink dolphin. The pictures and the story are true. As indicated in the eRumor, the original pictures were taken on June 17, 2007 by Captain Erik Rue of Calcasieu Charter Service, a company that does hunting and fishing charter trips in Louisiana. The pictures were taken on Lake Calcesieu, an estuary north of the Gulf of Mexico in Southwestern Louisiana. There is a species of what is called “pink dolphin” that lives in South America in the Amazon river. This sighting in Louisiana, however, is considered rare because it appears to be a bottlenose dolphin but pink ones are virtually never seen. Marine Biologist Dagmar Ferti told ESPN that it was an albino calf and that bottlenose calves don’t have much blubber so the the blood circulating under the skin is more visible, especially if the calf had been working hard to swim. He said this sighting was only the third that he knows of in the Gulf of Mexico. There have been 13 total sightings dating back to 1962. There is also a species of Humpback dolphin called the Indo-Pacific Humpback dolphin found mostly in Southeast Asia. Some of them have pink-colored skin because of blood vessels used for keeping the body temperature cool during exertion. One of them became a celebrity in Thailand and also a focus of controversy. The dolphin got caught in fishing nets during the summer of 2007 and ended up in a resort on the island of Samui in Southern Thailand. When reports surfaced that the dolphin was being trained to entertain tourists an outcry rose among animal rights activists. The government says the dolphin is scheduled to be rehabilitated and released back into the the gulf of Thailand by early 2008. This extremely rare and beautiful “pink dolphin” was spotted and photographed by Capt. Erik Rue of Calcasieu Charter Service on June 24th, 2007 during a charter fishing trip on Calcasieu Lake south of Lake Charles, LA. It appears to be an uncanny freak of nature, an albino dolphin, with reddish eyes and glossy pink skin. It is small in comparison to the others it is traveling with and appears to be a youngster traveling with mama. After spotting the beautiful mammal cruising with a pod of four other dolphins, Rue and his guests Randy and Peyton Smith and Greg and Sam Elias of Monroe, LA idled nearby while watching and photographing the unusual sight for more than an hour. Our expectations are high that we will see this amazing mammal again as it was in an area frequented by the gentle mammals and one confirmed report has it being spotted at least a month earlier in a nearby location. If it does turn up again, it will be a welcome surprise to our guests. Rosie O'Donnell likens radical Christians to radical Moslems-Truth!